Why are Star Wars fans and collectors buzzing about next months release of Topps STAR WARS: CLONE WARS? 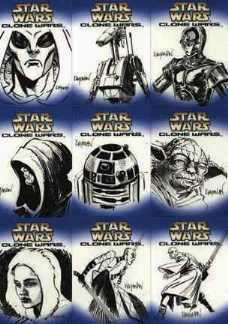 Because Topps commissioned 13 Star Wars artists to create truly unique sketch cards essentially making each card a one of one original. And every single hobby box has one! Guaranteed! Topps Clone Wars will reach stores the week of April 19th to coincide with Cartoon Network's premiere of Star Wars: Clone Wars-Season Two. Each Clone Wars pack will include 7 cards and carry a $2.00 SRP.